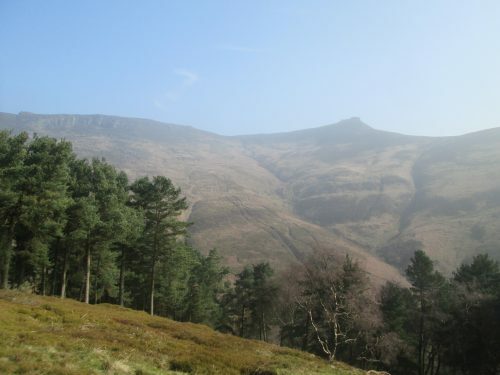 Kinder Scout held a particular thrall over me when I was younger, the highest point in the nearby Peak District but respected to the point of reverence. Its featureless plateau was something to be wary of. I only remember crossing it once, when I was considered old enough for this undertaking and I emerged on the far edge some distance from where I was intending. 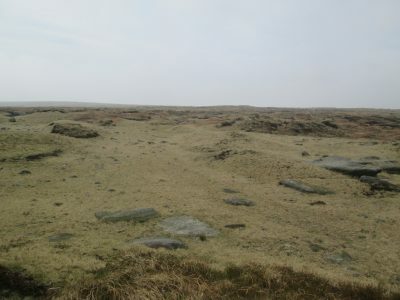 Maybe because instead of using a compass, I tried to navigate the maze of deep groughs leading into the hinterland from Kinder Gates. When finally this ran out and I neared the watershed, on which the theoretical (but invisible) high point was located, I climbed out of the grough into a remarkable landscape. I stood above a warren of black channels that stretched as far as I could see in every direction, bare peat onto which clung a thin covering of grass on the higher islands. The vision stayed with me, as of a desert, a peculiarly soggy but equally bewildering one. Returning to map the area for my new book, even now there is a sense of trepidation as if Kinder will somehow refuse to be mapped. Working on the surrounding hills recently, I had looked across the valley to see the massif invariably cloaked in cloud even as sun shone all around. The weather was kind this week, though. By the time I’d crossed Colborne and Brown Knoll, the morning mist had burnt off and there was a haze over the scattered outcrops of Kinder Low. 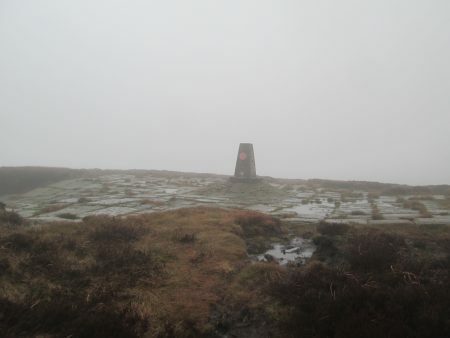 The trig point here stands by the Pennine Way but is obviously not on the highest point of Kinder Scout. Away from the edge, the pleateau rolls indiscernibly up another few metres, and it was here that I couldn’t wait to venture again. But a couple of things seemed strange. 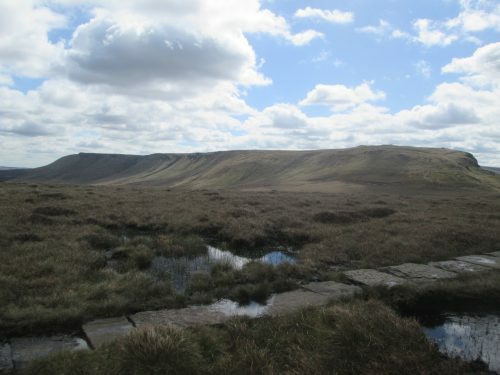 Firstly, there was a path, a very faint one angling off the Pennine Way and arcing round the high ground towards the summit. Secondly, there was no sign of any peat, literally none. The plateau was green rather than brown or black and thin grass and flowers covered every surface. In the groughs, water gathered behind plastic and straw fascines and other vegetation flourished. 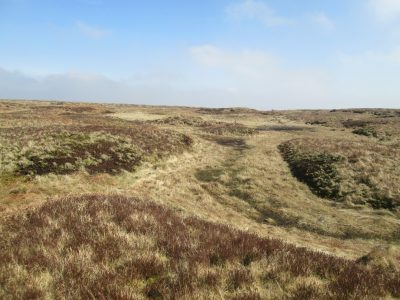 I was aware of the moorland regeneration work being carried out by Moors For The Future – in fact they were out blocking channels and reseeding bare peat that very week – but I thought this was a process that only just begun. I was struck by how quickly the air of the plateau had completely changed from one of dark menace to bright benevolence. It had the same other-worldly quality, the jumble of grassy humps and damp channels bearing no resemblance to the usual watershed drainage. Yet the faint path persevered, aiming for a tiny cairn on one of the highest-looking lumps. Was this the top? Another distant cairn suggested otherwise, perhaps elevated a further foot or two. There I proclaimed myself to be on the top of Kinder Scout as others had obviously started to do. The path ended and there was little beyond. I was able to look back and take bearings to Kinder Low and Pym Chair, but the only feature ahead was a pair of small conifers some way across the high ground. The following day I ventured up onto the plateau from Crowden Clough and found myself being drawn again to these distinctive trees. There were other conifer saplings on the plateau, probably a dozen in total scattered across the area, but none in such a prominent position as these. They stood on a rise near where the faintest branches of the River Kinder, Fair Brook and Crowden Brook all met. From them, you looked down to Kinder Gates, the rocky gateway to the north-western edge, and across to the tiny cairn on Crowden Head, an eminence of sorts. Whether this feature will remain so striking is hard to say, but right now it is as important a focal point on the plateau as Kinder Gates. The eastern end of the plateau is different. Lower and barely half a mile wide in places, it looks like it should be much easier to navigate. But by my third day on the plateau the mist was down and, as I ventured in from the rocks of Rowland Cote Moor, I quickly realised what a vast difference it made. I was looking for the wreckage of a Halifax MkII plane just a couple of hundred yards from the edge and tentatively followed a peaty grough. There was far more bare peat here and the going was more difficult, scrambling across peaty slopes and sinking into the black slop below. After what I thought was about 200m, I looked around for the wreckage, but could see very little and retraced my steps while I still could, thinking it would be more easily reached from the trig point.